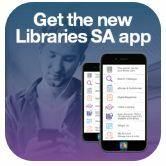 Please note, due to licensing restrictions this resource is only available for use in the Libraries. Ancestry Library Edition is a genealogy research tool for genealogical and historical research. Here are over 10,000 scholarly biographies of persons who were significant in Australian history. This resource provides health and medical information to improve the health and wellbeing of people and the communities they live in. Stay safe online with the help of these resources. Over 750 free online technology lessons. A variety of information relating to family genealogy including guides, indexes and digitised images of documents. Access the library catalogue and find items in your language. Catch-up on digital editions of all the South Australian issues of the Messenger newspaper. Aimed at assisting people wishing to pass the IELTS exam (International English Language Testing System). Trove is a new discovery experience from the National Library focused on Australia and Australians.